As we already know, watching movies is a very good way to learn a foreign language. Language input is important to advance Chinese language studies. Chinese cinema & TV offers excellent listening practice and can also really help with reading if you use Chinese subtitles too. That said, Chinese films are also worth watching for purely entertainment purposes. Luckily for us, Ollie Guest of ChineseMusings.com has compiled the following list of must-see Chinese films. Enjoy! There aren’t many well-known Mainland Chinese films in the West. That’s a shame – there are lots of great Chinese films, so it seems like we’re missing out. People who are learning Mandarin are missing out in particular: They’re putting all that effort into learning Chinese, but don’t get to experience this important part of China’s culture. So in this post, I thought I’d look at the 5 best Chinese films, according to IMDB. You can find all of them with English subtitles. So if you see one that looks interesting, give it a try and stand out from the norm! This 2008 film is a biopic of the Chinese martial artist of the same name. Ip was a master of Wing Chun, a martial art, and taught Bruce Lee among others. This film focuses on his choices (as well as fights!) during the Japanese invasion of China. Ip Man is actually the first film of a trilogy. The 2010 sequel showed the next part of Ip’s life – where he fled to Hong Kong to escape the Japanese and open a school. In the final film in the trilogy, he fights to secure the future of Wing Chun. 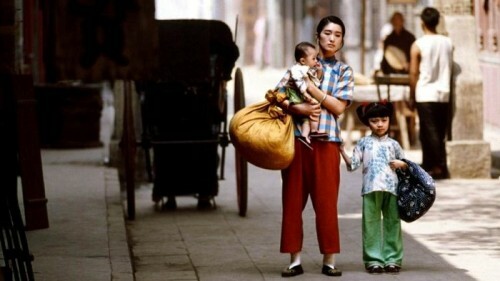 “To Live”, released in 1994, tells the story of a Chinese family between the 1940s and 1970. This was a huge period of upheaval from China: First was the brutal civil war, which brought the communists to power. Then there was the Great Leap Forward, Mao’s plan to industrialize Chinese which led to severe famine. Finally, there was the Cultural Revolution, a remaking of society along communist ideals. This film is powerful because it makes the viewer genuinely care about the characters as they try to endure their ongoing trials. Also directed by Zhang Yimou, this 1992 film is about China before the revolution, in the 1920s. It’s the story of a young woman who was forced to become a concubine to a wealthy man after her family went bankrupt. The other concubines all vie for their husband’s attention, as only his current favorite has a comfortable life. This competition is what causes the conflict – and indeed the tragic outcome – of the film. The film has been described by critics as visually beautiful because of its use of red lanterns and was nominated for the 1992 Oscar for Best Foreign Language Film. This film doesn’t just teach you about history, it also teaches you about a traditional Chinese art form – Beijing Opera. The 2 main characters are both orphans who were effectively forced into an opera troupe as children. There they undergo training and punishment so brutal that it’s compared to something from a Dickins novel. However, the film also shows the viewer that this harsh childhood is what allowed many Beijing Opera performers to become great. The film charts these boys through their lives – and uses 3 pairs of actors to show them first as children, then as teenagers, then as adults. Although China’s 20th century history plays a large role throughout the film, the Cultural Revolution is particularly important. In a scathing attack, the film shows how it forced the characters to renounce each other and needlessly caused innocent people to be thought of as criminals. 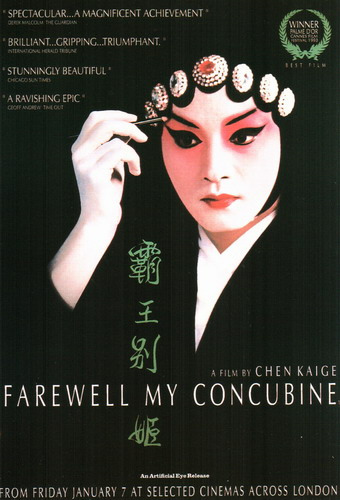 The film ends with the 2 characters performing the Beijing Opera after which this film is named: “Farewell My Concubine”. Farewell My Concubine is the only Chinese-language film to have won the Cannes Palme d’Or. The final film here, and another film which critics praise for its beautiful filming. This year 2000 film is set in Hong Kong in 1962. And it’s the first film here that isn’t largely about Chinese history! Chow Mo-wan with his wife and Su Li-zehn with her husband all move into an apartment building on the same day. The spouses are regularly away so the pair starts to spend a lot of time together as friends. Eventually, they discover that their spouses are having an affair. They then realize they also have feelings for each other. Much of the film, therefore, centers on whether or not they too will have an affair. I won’t spoil it for you! The film won the Cannes Festival award for best actor. Note: This film is mostly in Cantonese rather than Mandarin Chinese. I hope you liked these suggestions for Chinese films to watch and found my descriptions interesting. If you do watch any of these, your knowledge of China’s culture should really benefit: Not only will you know more about Chinese film-making, but when 4 of these 5 films are about China’s history, you’ll also know more about that! And if you want to watch even more films from China, be sure to check out the list from which I got these 5.